- SulAmerica Seguros, an auto insurance company in Rio de Janeiro, is encouraging people to ride bikes more. Irony, meet social responsibility. Handshakes all around. 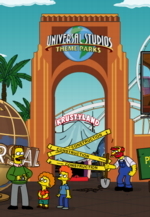 - Universal Studios Hollywood is building a Simpson's ride. It goes public at the end of May. This maddening website is their promotional vehicle of choice. - If you suffer from an inability to create good advertising, HANBOS gives you the remote control jammer, which disables the ability to change channels when ads come on. No word on whether it'll strap the audience down and pin eyes open too. But wouldn't that be neat?